Yesterday was my son-in-law, Stephen's, birthday. Early last week, I realized that it was approaching quickly and that I still had to make a card for him. He is both a yoga and a bicycling enthusiast. But I didn't have ideas relating to either one of those two interests pop into my head. So, I decided to make him a card that was cheery and maybe a little bit goofy instead. Going through my supplies for something that I thought would appeal to him (and me), I came across those little guys with their happy arms and signs from Cheerful Critters -- now retired, alas. The bear looked especially endearing, so I opted to use him on my card. Maybe I AM getting just a little crazy about fussy cutting and paper piecing, but that's what I went with again for this little guy. 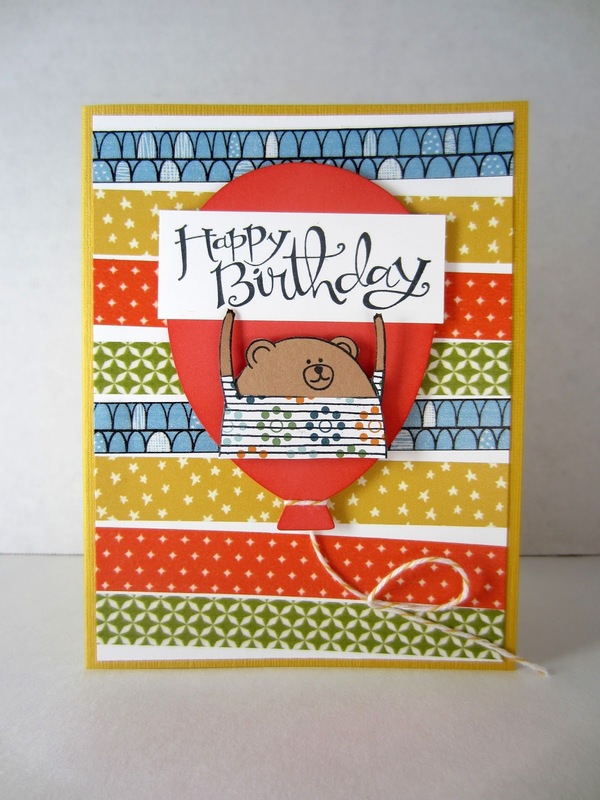 Going through my scraps of DSP, I came across this cute dotted design. I stamped his striped T-shirt onto that paper, then cut it out. 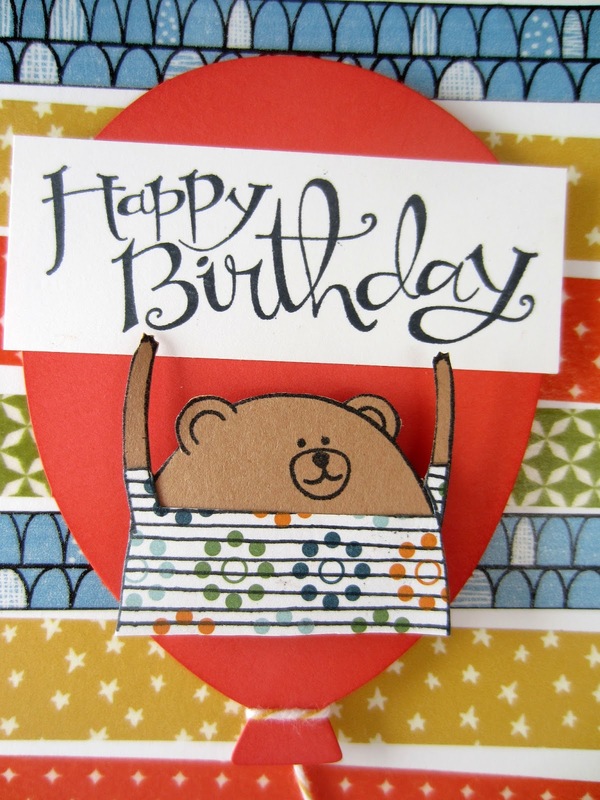 I stamped the little bear himself on a brown cardstock, and cut him out. I then dressed him in his new T-shirt. OK. Now, where do I go? 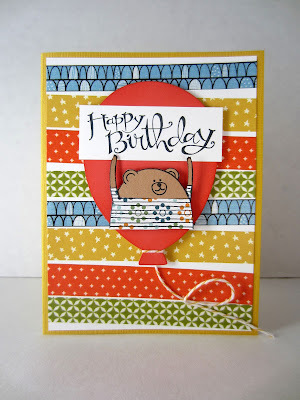 I had an idea of putting paper pieced balloons all over the background. With that in mind, I went through the stamps from my past Paper Pumpkin kits because I knew I had one of a balloon. During this search, I encountered one of the giant orange balloons from one of the recent kits. Since there was orange in little bear's fancy shirt, it seemed like the perfect solution. I tied some baker's twine around the bottom of the balloon. Well, now I have a nattily dressed bear and a big balloon. Of course, it was a no brainer that the sign his skinny little hands would be holding was to be created with the Sassy Salutations. Alright, now my focal point is done. What about the background of the card? Hey! I'd been meaning to use some washi tape in a project, but kept forgetting about it. So, I grabbed that container and went through my vast array of Stampin' Up! washi tapes, both current and retired. I chose four designs that would complement the colors in his shirt. I took a 4" x 5 1/4" piece of Whisper White cardstock, and just started stacking the washi tapes in haphazard horizontal lines, varying the amount of white space between the tapes. I gently tucked the torn edges to the back of the white piece. Nice and neat and clean. That background was aDORable! So, I mounted it to a card base of Crushed Curry. I was anxious to find out if Stephen liked the card, and was thrilled when he actually posted a picture of it on Facebook last night, attributing it to his mother-in-law, Linda Kilsdonk. Awwww! That is such a cute card! I love the bear. I'm sure glad he liked it. Oh my gosh...I love how cute this is! I think the bear is adorable!! Thanks for sharing on My 2 Favorite Things on Thursday! Hope to see you again this week! Pinned! How cute is that! 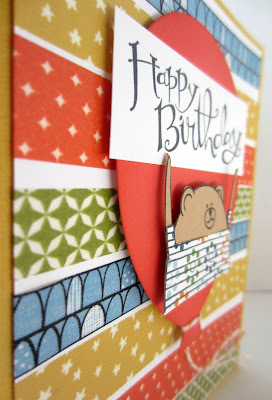 Thanks for visiting at #OMHGWW linky party this week.